In the age of Pinterest, Tumblr, Instagram and Reddit, reposting and “borrowing” without permission may seem harmless when everyone on the internet appears to be doing it, but it flirts dangerously with illegal practices that can infringe on others’ copyright. It can get you into serious trouble if you “borrow” from someone who then finds out and intends to seek damages. The ask-forgiveness-later approach is a very risky move. Merely attributing a work in many cases still does not give you free right to publish it. I fear that most people are entirely uneducated in matters of acceptable practices for sharing work and the legality of using, displaying, publishing or reposting work that is not their own. Instagram is not for content curation. You may only upload images to Instagram for which you have full ownership. These should also be applied as general rules with anyone’s work on Instagram. 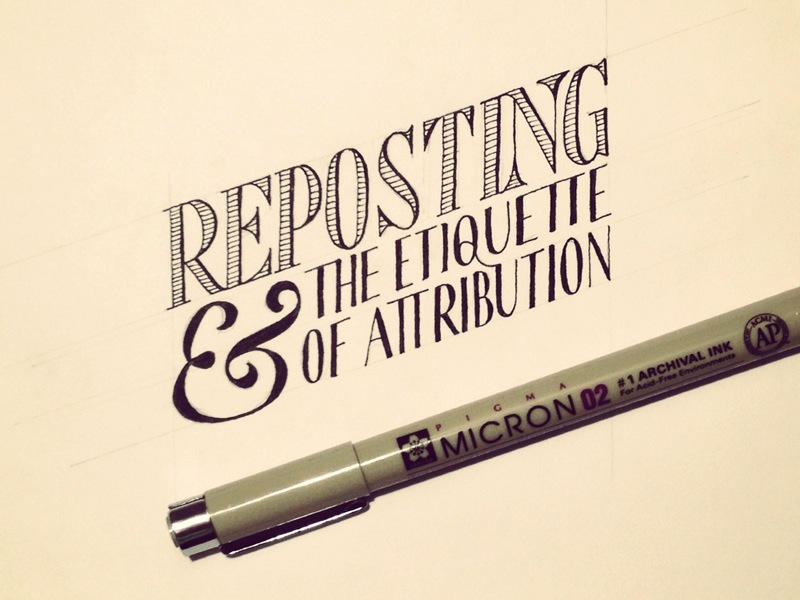 Some people may give you permission to post their work to your Instagram with attribution, but this should never be done without asking. Why can’t I repost your image? Shouldn’t you be happy I like your work? I’m very glad you enjoy my work. I do very much recognize the admiration that many have for my work, however it doesn’t mean that there should be free license to publish my work to their own profiles. Instagram is a bit different than a Pinterest pin, Twitter retweet, Facebook share, or even a tumblr reblog—it is a platform for publishing original work. The aforementioned methods lead directly to the original source when viewed. With Instagram, when someone uploads an image that does not belong to them, they receive free exposure, likes, and follows as benefit from another artist’s work. It’s not unlike if a magazine were to use your photo to attract readership and merely put your name in a footnote or caption—it’s not something that is permissible under the guise of “exposure”. Compensation would be required. Hopefully this gives you better idea of why Instagram is not a platform for republishing original works even if they are attributed. When can I be sure that it is okay to publish work? Does linking to the creator or tagging/attributing them automatically give me right to use their image? No. Never assume this. It is very important to understand that while attribution will often be enough for most authors to overlook use of their work without permission, it is not a guarantee or free pass to display their work. It is always best to ask permission no matter what. Aren’t there some cases where it’s okay to display or publish someone else’s work? The above scenarios can be summarized as ones that specifically benefit the artist. If you decide to take your chances, take a chance with something that benefits the artist. They likely won’t have an issue with you not asking permission if they can see that the point was to give them benefit. Can I use another’s image for my blog post as long as I link to them in the caption? If you are the one primarily benefiting from publishing the work, you better ask for permission. Using someone else’s image in your blog post without permission will almost certainly get you into trouble. It doesn’t matter if it is attributed or unattributed. You are using another’s work to create interest for your article. Because you are deriving value from the work by making your post more visually interesting, you either need to be paying for use of the work, or obtaining written permission from the author. Linking to the author does not give you a free pass to use their work. The only exception is if you are using an image under a Creative Commons license. What if I use a disclaimer that says “I claim no right to any images used”? It might make you feel warm and fuzzy inside, but it offers you absolutely zero protection. You are still infringing, and You Can Get Sued for Using Photos You Don’t Own even if you use a disclaimer. It sounds like what you’re saying is that I should pretty much always ask for permission, right? Now you’re getting it! Most artists are pretty nice people. But they also expect respect when it comes to their work. Ignorance isn’t bliss when you get hit with a lawsuit for using someone’s work without permission. Don’t ask questions later, ask them now! Respect the artist and play it safe. I’m an artist, and people often repost my work without permission. What should I do? In most cases, I will initially give the person the benefit of the doubt. I try to be kind as many are simply unaware that what they did is an infringement. It’s typically best with most people to approach the situation with this assumption to keep from things from getting too messy. It also gives you the best chance of keeping the person as a fan and establishing a mutually beneficial arrangement. If there is clear evidence of malicious intent or the unattributed use of your work has resulted in significant loss of profit to yourself, you may want to seek a settlement with the infringer or talk to a lawyer for help on pursuing reconciliation for damages.